Hog roast catering from Taste the Cracklin can adapt to any weather conditions, our hog roast is suitable for both indoor and outdoor events meaning that you don’t need to worry about the weather ruining a fantastic event. We operate all over the UK so if you want a hog roast, we can provide you with a succulent Taste the Cracklin at a venue of your choosing. It is important to remember that all Taste the Cracklin food is sourced locally bringing you the freshest ingredients on the day of your event, all food is prepared and cooked on-site to bring you the very best flavours. At Taste the Cracklin we have provided hog roast catering for a number of different events which have required a hog roast in Preston. Our chefs will always produce a succulent hog roast which is complemented by the side dishes which are also made by our chefs giving you the very best of hog roast catering. 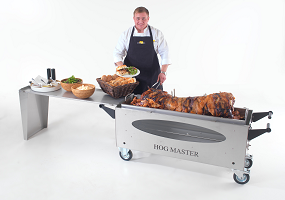 Hog roasting is the ultimate in catering the silver service of eating out doors! We had picnics, then barbecues out doors and now you can enjoy hog roasting! Picture the scene lovely sunny day marquee blowing in the breeze and meat sizzling away and having some one cook it for you too, well you can with Taste the Cracklin. Whether you want catering for a special occasion, or just for friends on a sunny afternoon. We can help you might have guests coming over for a dinner party and can’t be bothered to cook. Then give your friends a surprise and a new eating experience as to be honest, most have not had the pleasure in enjoying the taste of naturally cooked meat. Taste the Cracklin hog roast hire doesn’t just cater outdoor in the sunshine, we can also use our machinery indoors and you don’t need much space either they are not smoky and run on gas so are clean and convenient. We cater for parties all across the UK and have been really lucky to have met some fantastic people along the way, we have customers coming back to us time and time again and this is the greatest compliment we could ever wish to receive. We have now been doing this for two decades and we often comment that we cannot believe the years have passed by so quickly. We have also expanded to a new side of the business, allowing customers to hire one of our machines from us and cater for yourself! This has proven so popular, that we’ve continuously invested in more machines as to meet the demand, as it was so high. The way things are going this year, it looks like we may be buying more! Not only will we let you hire a machine we also supply you with the full package the food. We can also offer you with a fully prepared pig ready to pop on your machine and away you go! Or if you prefer we can offer you poultry or lamb and with the attachments on the machines you can cook lots of these at a time. If required, we can even bring our special dishes such as seasonal salad, which arrives in special packaging and is kept ice cold the dressing we use is to die for and complements the meat so well. Apple sauce is another favourite and we cant make this quick enough everyone wants the apple sauce and we are not surprised to be honest made from the finest apples and our secret spices it is amazing! Would you also like some freshly backed buns for your sandwiches? If so we can supply you with those as well, all made fresh on the day plump and crispy and huge they can also be cut in half to cater for little hands. Don’t worry we wont just drop everything off for you and drive away, we will help you get started and show you how everything works. Our driver will drop the machines where ever you desire and if you want to start using it straight away he will set it up for you and get the meat on the go he will guide you step by step and you don’t have to be a first class chef to hog roast as anyone can it is so easy. If you are not using the machine straight away our driver will leave you a DVD, this DVD shows you in simple form how to operate the machine and how to cook it also has lots of useful hints and tips on how to be the envy of all your friends and cook the most delicious crackling ever! We also leave with you our new menu booklet which we have just had printed and we are really proud of this little book all full of meal ideas and written by ourselves. Our drivers really are helpful and will stay with you for as long as need be but to be honest you will get the hang of the machine instantly it makes you look so professional standing behind one of our machines. Your guests will be so impressed with you, but we will let you into a secret even a person who has never cooked in their life could use our machines and that has happened in the past! Our rates are very reasonable and we always advise you to order your food from us too as you wont be able to buy cheaper especially the pig, who do you know who supply fully prepared pigs direct to your door and a very good price? Just us, we buy in bulk so have great savings that we want you to share so we pass on those savings to you, our sauces and salads are a steal and your guests will be impressed. We didn’t mention the carving and some are a little put off with this but we cannot stress enough how simple it is, you will be given a full colour pull out it shows you what each part of the pig is and how to carve it. It really is so simple all you need is a nice sharp knife and it also shows you in great detail on the DVD once people have mastered the carving they are after our jobs! So if you want to impress guest with your culinary skills give us a call and we will deliver the complete package direct to your door and we even supply you with the first gas bottle free now we cannot say farer than that can we. You can hire the machines all year around for as little or as long as you like and don’t forget if you do get really stuck give us a call our operators are on hand whenever needed, we think of everything so you don’t have to…. Okay, so you are based in Preston and you have that big event to organise at work. That’s right, it is the dreaded mid summer sales event or the annual awards evening where the same annoying people win the same prizes every year. Well, maybe you can at least make the event a bit better this year because you have been put in charge of sorting out the catering. Good job too because catering at events like this in the past have been terrible, haven’t they? Okay, the above is just an example but if you are ever in the position where you need to put on a catering solution that is going to delight people with great flavour rather than disgust them with mediocrity then it really is time that you discovered hog roast. You may be thinking ‘that’s a really old dish’ and you’d be right, but when it comes to flavoursome food and quality wholesome cooking, there really is nothing else that can come close to touching the results that a hog roast Preston based caterer can deliver. It is safe to say that when it comes to one of the best solutions in catering today, hog roast is right up there, if not at the very top. It’s some turnaround for the people of Preston that they can look forward to a catering solution of such quality as hog roast seemed to have disappeared completely. Luckily, it is back with us and helping to liven up all sorts of corporate events with the sort of flavours and aromas that you would normally only associate with a top restaurant. Can’t be bad, can it? Work events can be a nightmare when it comes to keeping everyone happy, and when you have the boss to impress, it can be very stressful indeed but it needn’t be like that. Bringing in the chef and making it a hog roast in Preston event could be a very smart move indeed because hog roast represents one of the tastiest and most versatile options that there is, and that could be very handy when it comes to impressing your colleagues, special guests and bosses. You may be reasonably familiar with hog roast if you have been to a hog roast event before. You will often find that these family style events serve up pig in a bun (hog roast rolls) and these you will no doubt have discovered are incredibly tasty, but there is a more cultured side to hog roast that may surprise you, and it is ideal for those events where you want to dazzle people. Gourmet hog roast shuns the informalities of being served on rolls and instead relies on the chef to do his or her best with their fine carving skills. You should see gourmet hog roast when served, it really does look supreme and your Preston guests will be amazed at just how brilliant it looks as well as tastes. So don’t settle for ordinary at your event. Make it a proud Preston hog roast event.